One of the tricky aspects for the composition was the vertical position of the cub. 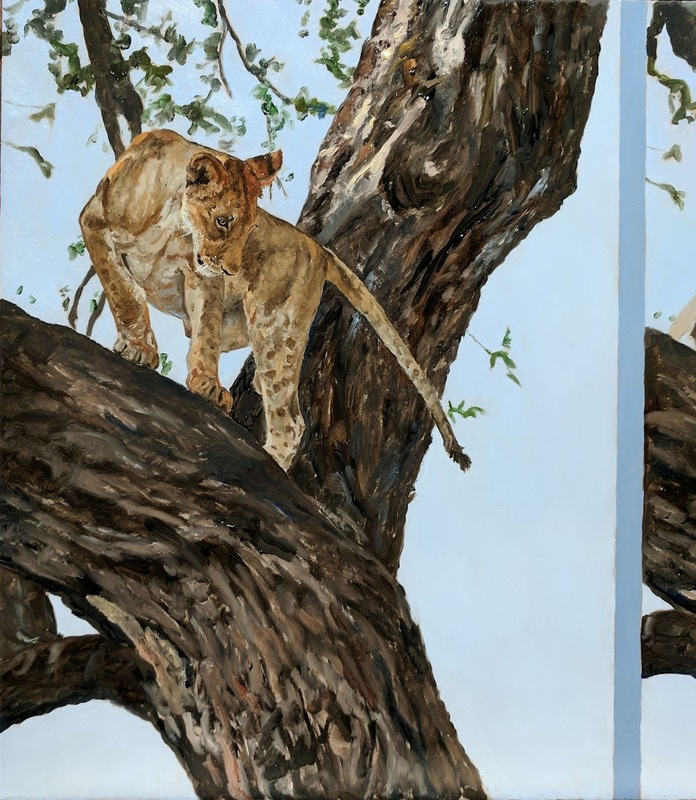 To accomplish a sense of movement, the cub in the first panel had to be highest and the cub in the last panel needed to be lowest. The first and last panels were fairly easy, but the middle one took lots of adjustment. I'd try about1/2" lower, then 1/4" higher until the position just felt right to me. No mathematical equations, no measuring. I'd keep asking myself if I felt the cub coming down the tree. When I did, that was it. The blue separating lines are painted. This is one gessoed panel. Actually, while I carefully created that blue to complement the sky, I now think it is distracting from the piece. It may be time to revisit that color decision. Now to my favorite part, the lion. I was in the Selous in Tanzania and arrived after the cub was already in the tree. It wasn't too long before he decided he wanted to get down. It was obvious he did not know how and he wandered around in the crook of the tree. What is making this painting particularly challenging is the tree bark. It has to match! I have a story I've wanted to paint for over 10 years and couldn't figure out the best way to portray it. With it rattling around in my head for that long I had almost given up hope. The only way to tell the story was in a triptych style similar to my painting Movement. In Movement, the piece is on one board and the borders are painted with colors from the foreground and background. Here is the start of the new story. 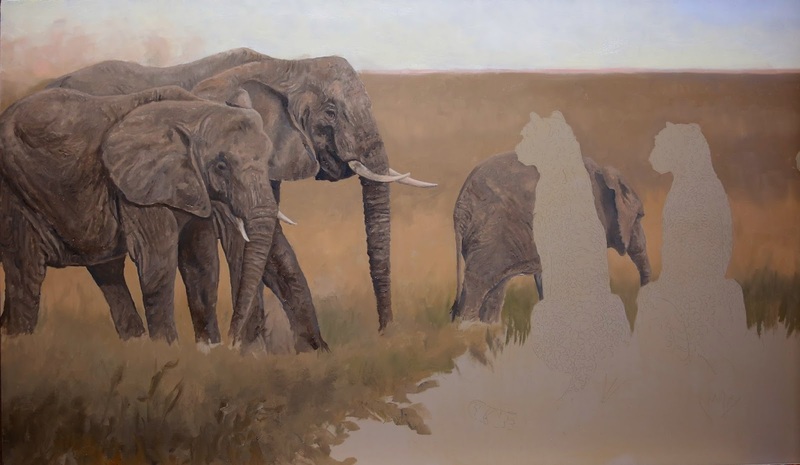 At this stage, the painting is almost finished. 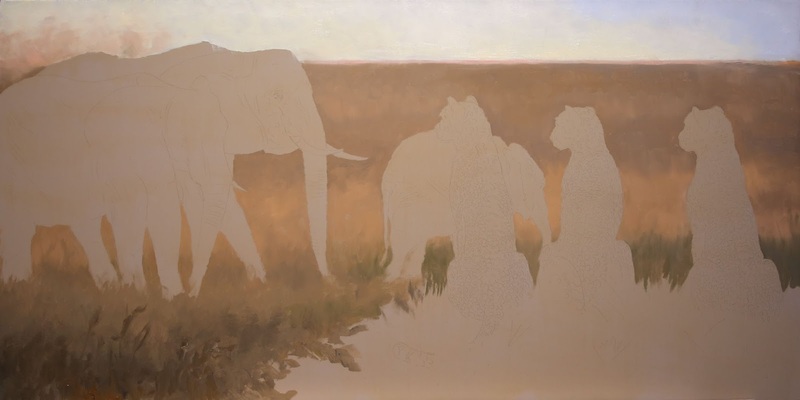 The grass needs highlights, the cheetah need backlighting, the elephants need to be pushed further into the background and their legs blended into the grasses. 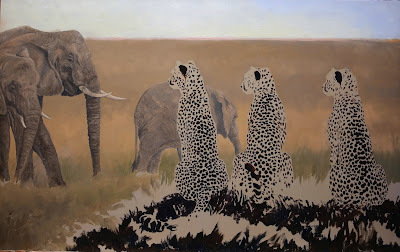 And the final detail will be to glaze more reddish orange onto the cheetah. 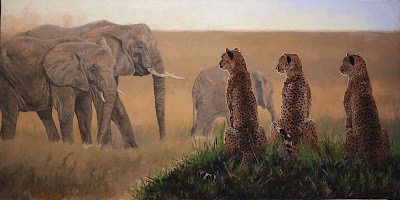 This will pull them further into the foreground and create more distance between them and the elephants. Using liquin the glazing will be subtle but hopefully effective. Note the bluish glazing on the elephants is similar to the sky color in the upper right of the painting. 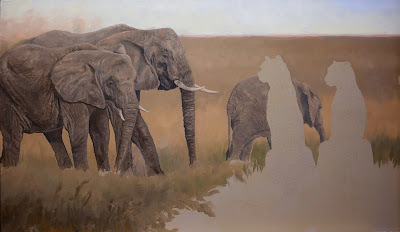 Above I have the elephants roughed in. Once they are mostly dry, I can work on the transition from the grasses to their legs. 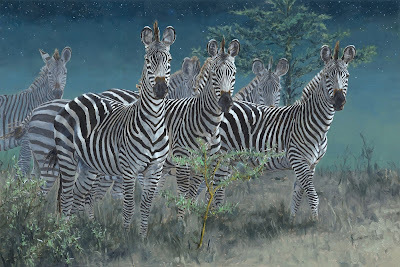 Like most times when I paint spotted or striped animals, (cheetah, giraffe, leopard, zebra, tiger, etc), I like to paint the spots or stripes first. Next, I'll fill in the background color and then revisit the spots, making sure the fur reads well. From the outlines you can probably guess where this piece is going. There will be some challenges because I haven't worked out all the transitions. Numerous thumbnail sketches might have given me a couple of hints, but I opted to go right for my brushes. Sometimes diving in and trusting your intuition can yield the best results. Guess we will find out. Safari Club International has named me the 2018 Artist of the Year. 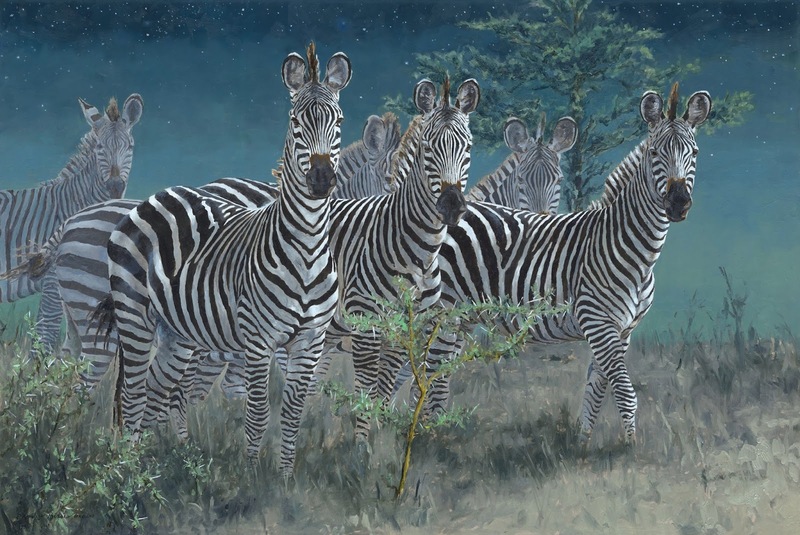 My painting Stars and Stripes Forever is the featured piece and will be auctioned at the 2018 Convention in Las Vegas, Jan 31 - February 3. In addition, 125 canvas giclees were made of the painting and will be distributed to Safari Club chapters across the country. Happy New Year! I hope 2018 exceeds your expectations and is filled with wonderful surprises.